This is the first of a series of blog entries about the techniques and tips from “The Inner Game of Music” by Barry Green and Timothy Gallwey. I have summarized the findings from this book – personal thoughts will be in brackets. 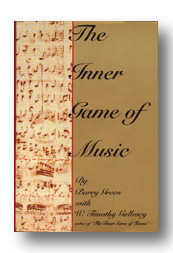 The author’s website can be found at http://www.innergameofmusic.com . The lower the interference, the more our inner potential is reflected in our performance. Have you ever imagined what it would be like to learn a piece at home, and then to play it perfectly in front of an audience? How about doing this while not getting distracted by your thoughts or doubt or anxiousness? Realistically, who hasn’t felt a measure of nervousness when performing in front of someone else? Some people feel so nervous before a performance that they feel physically sick. Others doubt whether they’ve memorized the piece, even though they may have practiced 200 times. As we learn how to play a piece, our teachers instruct us on the correct notes, the proper hand technique, and various physical ways to create a beautiful sound. But they rarely touch on what is equally important – what happens to the performer mentally, or internally. By the time a performance opportunity arrives, the musician has already put in hours of practice and work on their own. But the final obstacle is the inner battles raging within you: self doubt, nervousness, anxiety, the pressure to please family, friends, and yourself. This book compares musical performance to a game, and shares effective methods to “win” this game by overcoming such internal conflict. 1. Identify Self-Interference Exercise 1 (do this! ): Take a moment to think about and make a list of what makes you nervous about going on stage. Next, list the mental and physical effects that doubt and anxiety have on you. 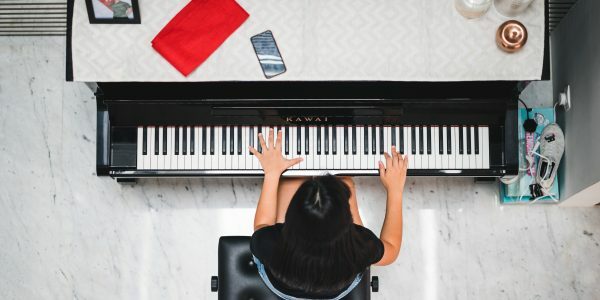 Common answers include: “I feel I haven’t practiced enough“, “I’m worried I might lose my place in the music“, “I don’t think the audience will like my playing“, “what if I forget what I’ve memorized?”. Common physical and mental effects include: dry mouth, shaky/clammy/sweaty hands, feeling sick to your stomach, feeling tense, can’t breathe, losing concentration, inner voice blaming self, etc. That voice in your head giving you all these ideas (let’s refer to it as Self 1) is talking to someone (Self 2). Both “selves” are in you. Exercise 2: Identify Self 1 – while reading this blog, notice any chatter going on in your head, and speak it out loud, and then speak it aloud. Notice when your mind wanders and how this affects your reading. Did you need to re-read? Your self 1 is your inner commentary. As children, we learn to walk and talk, and speak without interference (this explains why children pick up new skills such as swimming or skiing faster and easier than adults). Then, as we grow older, we begin to collect ideas, attitudes and concepts from our environment, and slowly this begins to affect the way we learn. What we had previously been able to absorb spontaneously and openly begins to close, and learning about this interference will help us regain this natural ability. However, we can CHOOSE not to listen to our Self 1, and when our mental and physical hindrances are gone, our performance can truly reflect our potential. 2. Ignore Self 1 Have you ever had a persistent child ask you for something while you are busy doing something else? Or listened to the constant tick of a clock in a quiet room until it becomes all you hear? How do you resolve this? Either you remove yourself from the situation, or choose to ignore it. Although our Self 1 may talk to us constantly, we have the choice to pay attention to it or not. We can tune into it, or ignore its attempts to get our attention. The purpose is to get us to our ideal state, which is relaxed, alert, and focused. We are fully concentrated in the present moment, and are enjoying ourselves. When we achieved our ideal state, we have the “master skill” of the game. If we cannot remove ourselves from our inner voice, how do we ignore it? Next time I will talk about 3 game skills (AWARENESS, WILL POWER AND TRUST) that will help in mastering how to ignore your inner voice as well and how to cope with your inner fears and doubts.